Surprisingly, there are no dairy products in this recipe. I began experimenting with it after sampling the peanut brittle made at Subiaco Abbey in northwestern Arkansas. This isn't the same, but can be great when the technique is mastered. An iron skillet works best. The general idea is to gradually heat the mixture to ensure the peanuts are fully cooked when the candy reaches the proper temperature. The times mentioned below require a total cooking time of an hour and a half and are those that work for me on my electric cooktop (beginning with a cool iron skillet). Times and temperature levels will probably differ for other equipment, so some trial-and-error will be required. At least the mistakes can be eaten. 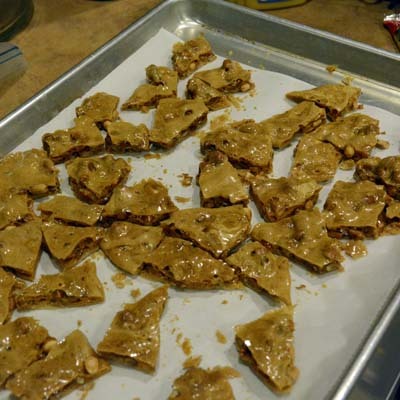 Peanut brittle broken into pieces after cooling. Put the sugar, corn syrup, and water in an iron skillet. Turn on the burner to a low to moderate level (say 4 out of 10) and cook and occasionally stir the ingredients until they are well mixed. Add the peanuts after about 20 minutes cooking time when the mixture has reached about 150 to 200 degrees (Photograph 1). After the mixture begins to bubble vigorously, add the sprinkling of salt and stir the mixture more frequently. After cooking for about an hour as the temperature rises toward 300, increase the temperature slightly to medium heat (say 5 out of 10). 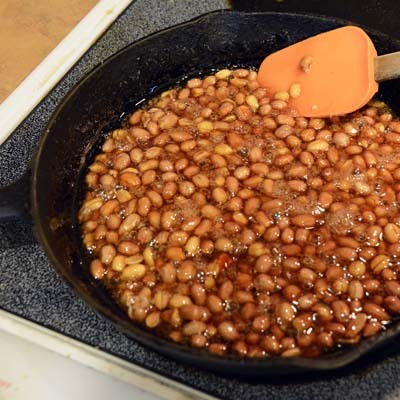 When the temperature of the mixture has reached a solid 300 degrees F (at which point it should be thick, "caramel" color, and the peanuts browned), remove the skillet from heat. 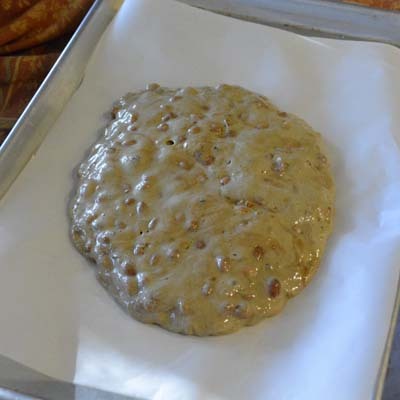 Quickly spread the baking soda over the mixture, stir the soda into the mixture until well mixed, and then pour the mixture onto baking parchment on a metal pan or cookie sheet (Photograph 2). Let the mixture spread under its own weight and allow it time to cool thoroughly (30 minutes or so). Once the brittle has cooled to room temperature (Photograph 3), break it into pieces (Photograph 4) before it attracts enough moisture from the air to make the brittle sticky. The brittle can be stored in food-grade plastic bags that do not allow moisture into the bag. The amounts above make between 28 and 30 ounces of peanut brittle, enough for four 7-ounce bags. Photograph 1. Mixture after about 30 minutes cooking time. Peanuts have just been added and the mixture is bubbling slightly. Photograph 2. Hot mixture poured onto parchment to begin spreading and cooling. Photograph 3. 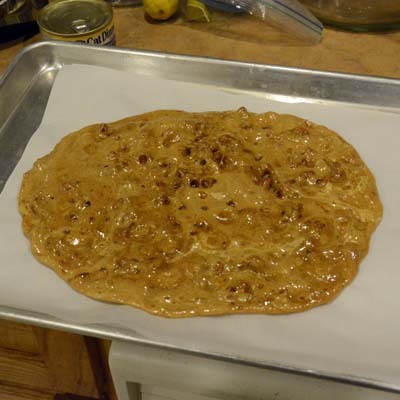 Cooled peanut brittle before breaking into pieces. Photograph 4. Fully cooled peanut brittle broken into pieces before bagging.